The following article was written by anarchist political prisoner Sean Swain in response to an article in Rolling Stone “Why Occupy Needs to Start Making Demands.” To write to Sean, see his address below. A recent article in Rolling Stone presented a picture of Occupy divided over the issue of “demands.” According to the article, one faction opposes demands while another views demands as a practical and inevitable strategy. The article leaves the distinct impression that either Occupy is divided or else the mainstream media, who hasn’t been able to wrap its mind around the reality of what Occupy is, has itself become obsessed with the issue of demands and lacks the imagination to conceive of any other way for Occupy to proceed. I would like to add my voice to the dialogue. I would suggest that making demands would be very difficult, if not impossible. Before making any demands, at least 3 questions must be definitively answered: (1) Who is making the demands?, (2) To whom are the demands made?, and (3) What will be done in exchange for the meeting of demands? If you do not have the answers to those questions, then you cannot effectively enter into any demanding or negotiating. You may as well make your demands to the wall. As to the question of who is making the demands, Occupy presents itself as a movement of the 99%. That means anyone making demands must be making them for the entirety of the 99%. As I am part of that 99%, for the purposes of informing anyone seeking to make demands, the two non-negotiable demands that should be made on my behalf are: (1) The immediate and complete abolition of the global system of capital, and (2) The immediate and complete abolition of the United States as an incorporated entity, including its state subsidiaries. All other points are negotiable for me. Good luck. But I think this presents my point succinctly that it is impossible for anyone to present demands on behalf of the 99%. The second question, to whom the demands are made, is just as complicated. Some in Occupy want banks re-structured, some want recognition of Occupy’s right to exist in public spaces, and some may want the release of secret documents linking space aliens to the JFK assassination. All of these demands require negotiation with a variety of different institutions and governments on many levels. This requires the juggling of millions of demands issued to thousands of agencies and organizations, and juggling the various responses. Again, good luck. And this brings up another issue to consider, related to power relationships. When issuing a demand, you’re recognizing the authority of the person or entity to grant or deny the demands. You are, in essence, accepting that they have the right to exist, and you are seeking resolution with their legitimate exercise of power. I do not think this can be done on behalf of the 99%, as some of us do not recognize the right of governments, banks, or corporations to exist. They have no authority; they have the power to compel. That brings us to the third question, what will be done in exchange for the meeting of demands? Before a representative of Occupy (however that would work) could present demands (whatever they would be), the representative would have to be able to guarantee that, when demands are met, Occupy would relinquish something or give up something, or refrain from something. That is how demands work. It must be understood by everyone at the table that, related to Occupy, if all demands are met, then everyone involved in Occupy will pack up the tents and apply for work at WalMart and Starbuck’s, resuming their shopping at the mall. If Occupy’s representative cannot guarantee the authorities that the 99% will return to dragging stones up the side of the pyramid when demands are met, then there is no way to issue demands; the demands are meaningless because even if they are met, nothing will be resolved. For my part, I only hope there are others as unreasonable as I am, and that they will not resume their roles as slaves under any conditions, that the system can meet their demands when it ceases to exist. So, having presented what I hope is a brief and effective argument for why demands are an impossible way forward, I would like to provide an alternative way of viewing the current reality, which may inform us as to an effective way forward. Occupy is a system that poses as an alternative to the hierarchical, corporate, global-colonizer system (we can just call it “the enemy system”). It may seem strange to think of Occupy as a system because it is consciously unsystematic, but it is a system in the same way that biosphere is a system, containing a diversity of life. In many ways, Occupy is the un-system. All the same, Occupy, as a system, is facing down an enemy system that does not tolerate alternatives to itself. How many people do you see foraging? Hunting the buffalo and living in a wigwam? Exactly. The enemy system eliminates alternatives. It does not play well with others. Your system, Occupy, cannot co-exist with the enemy system because the enemy system will attempt to eliminate you through whatever means are available. It will send its cops and military to crack your skulls. It will send snitches to infiltrate you and divide you. It will unleash propaganda to isolate you and brand you as terrorists. It will then confine you and neutralize you and maybe kill you. The reality is this: We have two systems, opposing cultures, and one will eliminate the other (or, in the instance of Occupy prevailing, weaken the other system so it no longer has the power to eliminate you). This is a culture war. That may not be the term you like, but whatever euphemism you choose, the reality is what it is. A hostile system is at war against you, and you can either win or lose. The longer the enemy system exists, the more it will harm you. As Ward Churchill, Derrick Jensen, John Zerzan, and a host of others have pointed out, your interests are best served by taking down the enemy system as quickly and effectively as possible. Then we’ll all be free to live as we choose, without interference. Occupy must be led by no one. Because the enemy system is centralized, hierarchical, and rigidly structured, Occupy can only defeat it by being what it is not. Being leaderless, everyone must lead themselves and thus have the transformative experience that will never again let them become sheeple. A leaderless Occupy is more difficult to defeat. Occupy must proceed according to no plan. With no leader, no architect, there is no one to herd Occupy into conformity to a singular plan. Variety and diversity of tactics forces the enemy system to herd cats. If anyone come up with the perfect plan, burn it immediately. Occupy must have no targeted end-point. For reformists seeking to make demands, this point will be difficult. To proceed with no end-point is to view yourself as developing a way to live into the future, for yourself and your children. It implies no compromise, no return to the enemy system. It says you will live as you live until the enemy defeats you or goes away. Occupy must develop a new currency of support. The enemy system rewards its supporters with pay that translates into material goods. You end up with unhappy slaves with large piles of material stuff. Occupy must have a different “currency.” Rather than paying supporters with money that translates into material goods, Occupy must re-pay supporters with support. In other words, those who give support will get support. You are rewarded not with material junk, but with community and belonging and care and support. Social support must be Occupy’s currency. Occupy’s advantages are its diversity and de-centralization. Each autonomous group can develop its own strategies and approaches to living, and those efforts will become part of Occupy’s collective knowledge as each group builds upon the ideas of others and perfects others’ failures. This provides a start-stop-start progress, unlike the enemy system which attempts to impose one uniform program for success. Occupy cannot prevail all at once. There is no magic button to push to make 8,000 years of control programming go away. There are, however, a million very practical buttons to push repeatedly and in no particular order that will make the control program collapse fairly quickly. It will not collapse at once but will unravel, faster in some places than in others. At some point in the future, we will realize the enemy system has gone away completely. 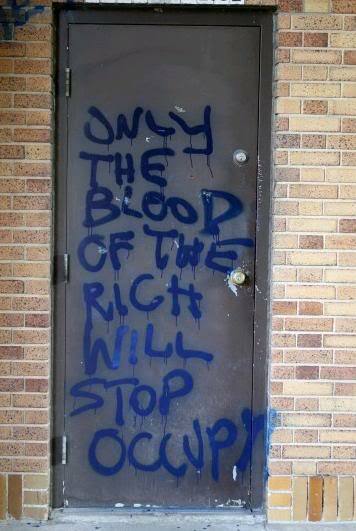 Occupy must recognize no authority but its own. The 99% have no presidents, no representatives, no congress, no courts. The 99% have no bosses, no bankers, no managers. The 99% have no joint chiefs, no police, no military. All of these things are the property of the 1%. They are all components of the enemy system that we must reject. By this view, we should have no illusion of any authority but our own authority. We have no one to negotiate with. There is no one who has authority to “grant” us the future we strive to construct directly. I suggest these 7 points as a general guide. I hope they provide a kind of framework for moving forward without the reformist model of making demands and negotiating with the enemy system. It is my hope that these principles can guide Occupy not only to defeat the enemy system, but also guide Occupy into the future beyond the enemy system’s collapse. I think these principles shape localized communities we all deserve.